Do you have stocks you are down in? Are you hesitant to take the loss because you feel certain they will eventually come back? Do you just want to get your money back FAST? If you answered YES to any of these questions, then YOU MUST WATCH THESE VIDEOS. ► AN EXACT STRATEGY to use when you are down in a stock. ► A STEP-BY-STEP PLAN on what to do next if a stock goes down right after you buy it. ► A METHOD to avoid worrying whether a stock will eventually come back to breakeven. To get FREE ACCESS to the EZ Stock Rehab & Repair Strategy video training, click here. Did you know that at least 80% of all people who attempt trading can’t get past breakeven, eventually blow up their account, and finally give up? It’s a sad and staggering number if you think about it. As a full time trader myself for over 20 years, I personally have gone through more than one big draw-down while trading, and I truly know the emotional pain that comes with losses. Unfortunately, I even know a few people who have never psychologically recovered from taking a beating in the market… traders whose lives and emotional well-being were changed forever. But it doesn’t have to be like this. All you have to do is master the #1 thing that influences ALL the decisions you make. It’s actually the single biggest variable in your trading. Learn more here. When it comes to S&P 500 Mini, Gold, Mini Nasdaq, or Crude Oil Futures contract trading, the instructors at Larry Levin’s Trading Advantage are top notch. Trading Advantage has developed a proprietary methodology to teach traders the subtleties of trading these markets consistently. Trading is taught in a Virtual Trading Room that allows students to see exactly how the trades are taken and managed in real time. 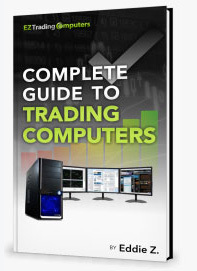 Click here for Larry’s FREE Trading Tips. NinjaTrader is the preferred active-trader platform for traders worldwide, including our clients. Many of our professional day trading EZ Trading Computer customers use this platform. Whether you are just getting started or have been trading for years, NinjaTrader’s easy-to-use and feature-rich platform provides everything you need to be successful day trading the markets. Learn more about their unique platform. Active traders world-wide demand reliability, speed, accuracy, and cost-effectiveness from their financial market data provider, and Kinetick delivers it to them every day! Kinetick provides fast, unfiltered, real-time quotes for stocks, futures, and Forex that exceed the expectations of the world’s most demanding traders… like us! Please visit the Kinetick website to learn more about its capabilities including how it can be used for FREE with End-of-Day data, and how to eliminate CME Group Globex exchange fees on real-time market data! Learn more about Kinetick. TradeLog Software is the top choice of leading trader tax experts and thousands of active traders for accurate trade accounting and trader tax reporting. For over fourteen years, TradeLog has generated accurate, IRS-ready reporting for Schedule D capital gains and wash sales – including the new Form 8949 – as well as Section 475f mark-to-market accounting and Section 1256 contracts. TradeLog imports and manages your trade history from over 35 supported brokers. The software also includes powerful filters and analysis reporting to help you better understand your performance and profitability. Visit the TradeLog website to learn more and download the Free Trial. Hawkeyetraders.com – Forex trading and trading software.